You’re invited to a cupcake party with all your favorite Disney Princesses! Work together to make as many cupcakes as you can before it’s time for the party. Follow the recipe cards to pick the perfect fancy liner, frosting, and topper. 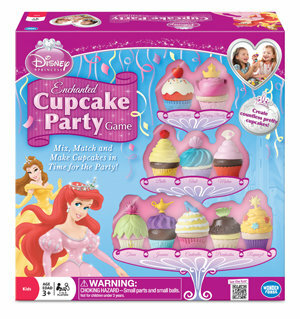 Each cupcake creation is fit for a princess in this sweet game of mixing and matching! Race to crown your cupcakes! Children will love building these adorable 4-piece cupcakes! Creative, social play at its best! Standard play-dates are transformed into exciting parties filled with laughter and conversation, as players practice teamwork and cooperation to build as many cupcakes as they can before the time runs out. In this innovative game, each cupcake is uniquely designed to match one of the Disney Princesses, but there are lots of opportunities to get creative! Use the interchangeable cupcake pieces to make your own original cupcake creation- there are dozens of dazzling cupcake combinations. As a team, players decide which color deck they will play. Each deck offers a variety of cupcake combinations. The pink deck has recipes for single princess cupcakes. 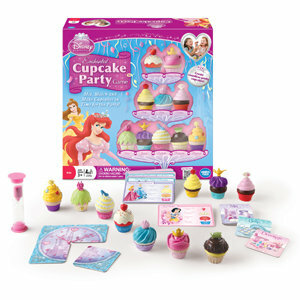 The blue and purple decks have recipes that combine cupcakes featuring two or more princesses. When players flip all three of the Mix, Bake, and Decorate tiles, it’s time to draw a Recipe Card and work together to build the cupcake. Players continue to draw cards and build as many cupcakes as they can before the sand timer runs out. Players build cupcakes until all four Clock tiles are flipped over. Then, it’s time for the party! Wonder Forge has won over 120 prestigious awards by creating good-for-you games that encourage positive attitudes, teamwork, healthy competition, and get-up-and-go active play! Disney Princess Enchanted Cupcake Party is a winner of 2012 Oppenheim Gold Award, 2012 Play Advances in Language Award, and 2012 Creative Child Game of the Year Award! Enchanted Cupcake Party stands the test of time with high-quality pieces and princesses that span many generations- from the timeless Sleeping Beauty to the modern Rapunzel! 40 Cupcake Parts, 30 Recipe Cards, 10 Tiles, 1 Sand Timer, 1 Game Rules Manual. The game is intended for 2 or more players, ages 3 and up.